Picture this, scenic coastlines, crashing waves, picturesque light houses. That is what we had planned for our drive from Halifax to Yarmouth, what we didn’t plan for is the ice-rain, 50km winds and 2 degreee tempreatures! First stop was Peggys Cove, about 40 minutes from Halifax. You may recognise the lighthouse as it is very popular to tourists and photographers. With a year round population of only 40 it was not what I expected of such a well known spot. The houses where dotted across the rocky coast and fishing boats and lobster traps weathered on docks waiting for the summer. 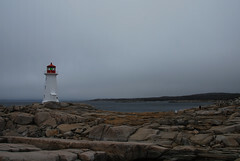 We followed the Lighthouse Scenic route to Lunenburg a 200 year old fishing village and now a UNESCO Heritage site. Unfortunatley given the weather we were unable to take any good photos but the town is very quaint with its streets of colourful weatherboard homes and red fishing sheds. Whilst it was a larg fishing port and ship building town Lunenburg is now a haven for tourists, artisists and historians.